Time is a troublesome thing. Whether in films, books, games or comics, time travel has the capacity to provide a clever crutch for a narrative. It also has the capacity to overcomplicate things. Massively. In the case of Days Of Future Past, it allows for the new reboot of the series to be temporally linked to the previous X Men trilogy. 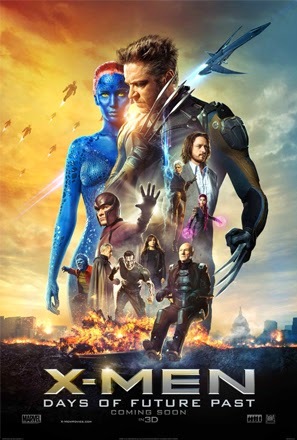 In a bleak future where robotic sentinels are sent to destroy all mutants, Professor X (Patrick Stewart) and Magneto (Ian McKellen) send Wolverine (Hugh Jackman) back in time Terminator style to meet their younger selves (James McAvoy and Michael Fassbender) and stop Mystique (Jennifer Lawrence) from murdering Dr. Trask (Peter Dinklage) before he can create the sentinels that destroy them, allowing for plenty of Inception influenced action within action. Following? Good, because I don't think even Hugh Jackman knows what he's doing here. On a cynical level, the narrative works for three reasons. Firstly it allows for plenty of geek fan service with fleeting and inconsequential cameos from characters across all the films. Secondly, it shoehorns the most popular character (Wolverine) into the new reboot. And thirdly it hinges its storyline around the hottest actress of the moment (Jennifer Lawrence), despite her character having a small part in the original trilogy. At the least the future of the franchise is in the safe hands of a talented cast. Fassbender and McAvoy take over from their Shakespearean forbears and bring some welcome ambiguity to their roles: McAvoy as the foul-mouthed Charles Xavier hooked on drugs that suppress his powers; Fassbender as the impassioned but ruthless Magneto. Lawrence, too, ensures that Mystique is more than just a slinky blue naked body. The main issue, however, is that with so many mutants there's a distinct lack of characterisation. Instead the film assumes a substantial amount of prior knowledge without developing its characters beyond the muddled time travelling plot. Some inadvertently amusing moments and shoddy one-liners don't help the script. The X-Men aren't given much of a chance to flex their mutant muscles either. Sure, those in the future struggle to fight an army of incoming sentinels with a multitude of powers but with limited screen time we're not invested in their battle. Elsewhere it's mainly Magneto at the centre of the action, proving he's the most badass of the lot. That said, it's Even Peters as Quicksilver who's given the coolest moment as he uses his super speed to destroy a whole room of guards in slow motion, before being shamelessly dropped for the rest of the film. Most of all, the producers have shot themselves in the foot. A reboot of a series works in isolation, but Days Of Future Past doesn't stand alone. By mixing the various films together, the overall timeline has been well and truly ruined. It's not just the mutants messing with time, but the producers as well.